From any point of arrival including Ouagadougou Airport: drive towards Ouaga 2000 neighbourhood. At the interchange take Muammar Gaddafi Boulevard leading to the new Presidency (Kossyam). Approximately 200 meters after the Institut Africain de Management (African Institute of Management IAM) look to your left. You will see a signpost indicating Cours privé La Fontaine (La Fontaine School), by the building of Fonds d'entretien routier. Follow the arrows to the school. 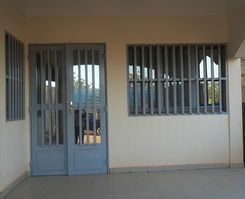 The Guesthouse is directly opposite the school (House number 93). Welcome!